Now fully updated for Blender 2.78b and beyond, Learning Blender, Second Edition, walks you through every step of creating an outstanding 3D animated character with Blender, and then compositing it in a real video using a professional workflow. This edition covers the powerful new selection and modeling tools, as well as high-efficiency improvements related to other parts of the project such as texture painting, shading, rigging, rendering, and compositing. Still the only Blender tutorial to take you from preproduction to final result, this guide is perfect for both novices and those moving from other software to Blender (open source and free software). 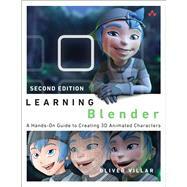 Author Oliver Villar provides full-color, hands-on chapters that cover every aspect of character creation: design, modeling, unwrapping, texturing, shading, rigging, animation, and rendering. He also walks you through integrating your animated character into a real-world video, using professional camera tracking, lighting, and compositing techniques. The rich companion website (blendtuts.com/learning-blender-files) will help you quickly master even the most complex techniques with bonus contents like video tutorials. By the time you’re done, you’ll be ready to create outstanding characters for all media—and you’ll have up-to-date skills for any 3D project, whether it involves characters or not. Oliver Villar, born in Galicia (Spain) in 1987, has been drawing since he was a kid. His interest in art brought him into 3D, which he’s been studying since 2004. He used different commercial 3D software before stumbling onto Blender in 2008. Since then, he uses Blender professionally as a freelance 3D designer and tutor. In 2010 he funded blendtuts.com, a website in which he’s devoted to offer quality Blender training videos to the community. Currently, he’s working as the co-director of Luke’s Escape, a 3D animated short film made with Blender.